We’ve arranged a series of public speaking tips to help you with better presentations and speeches. We are confident you’ll appreciate them because all the tips feature in our training. You too can benefit from all these tips. First, you can watch the tips here, in video format. Or, second you can receive the public speaking tips direct to your email. Or, of course, you can join us on a public speaking course. Your office party at this time of year is a great occasion. It’s great because everyone can let their hair down and have a good time at the company’s expense! Is that why the Finance Director isn’t too happy? But aside from the excellent party, there is the small matter of your office party speech. And, of course, it’s your job to give the office party speech this year…yes, I’m afraid it’s a privilege of office. You’ve got this far in your career and now it’s your turn to speak at the office party. You’ve probably already tackled several conference speeches this year. And, you might have already given your year end speech. 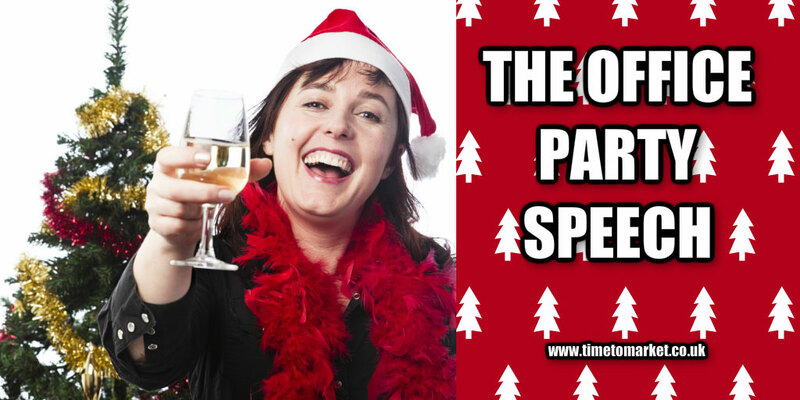 So, you are well set to give a good performance with your office party speech. Therefore, these top ten tips should help you make it a pleasant experience. Use a microphone if you can. Keep it brief, as brevity is best with your office party speech. Remember to thank the organisers! You can depend on the fact that your audience will hear you out and be appreciative when you follow these guides. That’s not least because you plan to be brief and appreciative about everyone’s best efforts. Awards and presentations always go down well with an office party. But, do remember to keep the pace lively and don’t linger too much. Because the party-goers have some serious partying to do!